A decent cycle tool is always handy to have in your cycle bag. There are a large range of maintenance tools available from multitools to lubricants such as GT85. 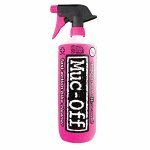 After a muddy ride you'll want to make your bike look brand new again with our range of cleaning products from Muc-Off.